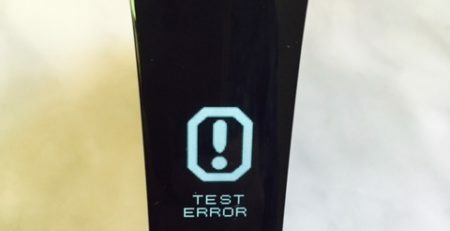 A few musings this morning about testing food for gluten & the Nima Sensor. 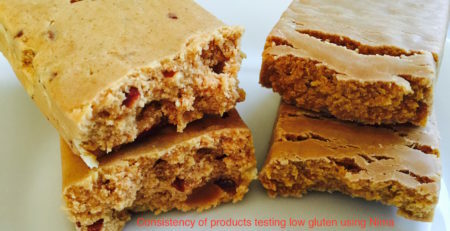 Background, I have been commissioning testing of gluten-free food for about 15 years. Does this make me an expert? No. I am a dietitian fortunate to have learned from the experts—the scientists who specialize in testing food for gluten, including the late Dr. Mendez (you may recognize his name from the R5 ELISA Mendez Method). Before sending a food to the lab for gluten testing, I study the ingredients list. 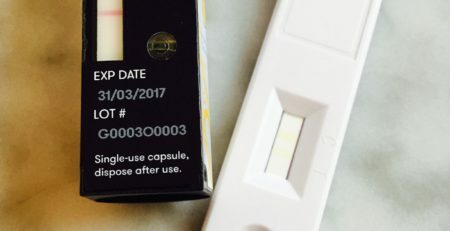 Should this product be tested with a sandwich R5 ELISA (tests for intact gluten)? Should a milk additive be added to the extraction process (recommended for certain food mixtures)? Should the competitive R5 ELISA be used (tests for gluten protein fragments)? Should fish gelatin be added to the extraction process (recommended for certain food mixtures)? Does this product contain anything that should be neutralized before testing? Does this product contain oats? What gram amount of product should be homogenized and extracted for testing (varies from 50 to 200 grams homogenized and 0.25 to 1 gram tested). Products commissioned for testing by GFWD are always tested at least in duplicate. Meaning 2 extractions are tested from a larger (50 to 200 gram) homogenized sample. Why are samples homogenized or ground? This is done because gluten may not be evenly distributed within a product. Mixing/grinding helps to more evenly distribute any gluten that may be present in the sample. If the two extractions come back with substantially different results, additional testing is done to try to further homogenize the sample. 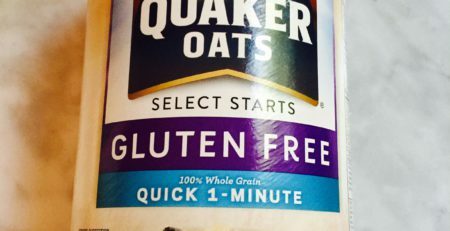 Imagine trying to evenly distribute a single grain of wheat in 200 grams of oats. So, onto the Nima Sensor. Two purchased gluten sensors sit in my office. 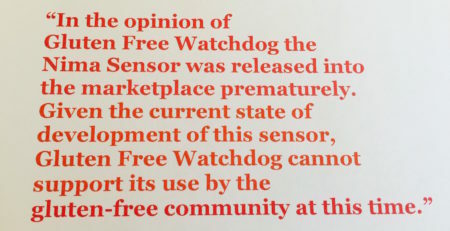 I have been evaluating and posting about this gadget for 3 years. My first post included my expectations of when testing using the Nima would be helpful—testing for gluten when it is evenly distributed. 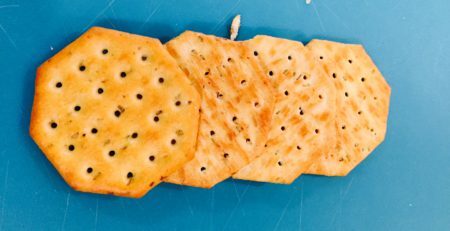 And when it would be less helpful—testing for gluten when it is not evenly distributed, testing difficult food mixtures, and testing foods that may contain gluten that has been broken down. There is one occasion when I found the gadget useful, and the experts among us such as @adrogers (Twitter handle) may even be able to find fault with this use. I used the Nima to test an errant grain found in a bag of lentils. It looked like barley and was hard like barley. It was too small to test using the R5 ELISA. So, my husband smashed it with a mallet and I tested it using the Nima. The result was low gluten. In my experience, when testing barley grain and barley flour the gadget returns a low gluten reading. Testing wheat and rye results in a high gluten reading. Note: I have the older version of the gadget and did not update it. Current gadgets no longer return a low or high reading. The bottom line for me: If I test a pea-size amount of food from a non-homogenized sample and the result is a smile what does this tell me? Based on the FARRP study and the table presented during a FARRP webinar about the study (table posted at https://www.glutenfreewatchdog.org/news/gluten-free-watchdogs-updated-position-statement-on-the-nima-sensor-for-gluten/)it tells me that the pea size amount tested may contain from below 5 parts per million gluten up to 40 parts per million of gluten. It does not tell me anything about the rest of the food on my plate. If the result is gluten found what does this tell me? Again, based on the data from the FARRP study (as well as data previously provided by Nima) it tells me that the pea size amount tested may contain from below 5 parts per million of gluten on up. Look at the overlap. Both results—smile and gluten found include values from < 5 ppm up to 40 ppm (and even higher for some mixtures). 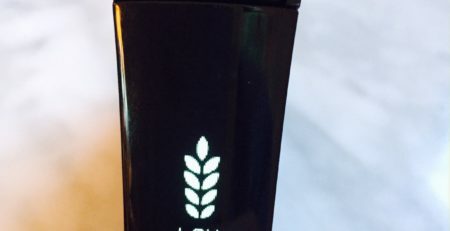 Maybe if the Nima team can improve upon this overlap, this gadget may have some of the uses that I was originally hopeful it would have—testing for gluten in foods when gluten is likely to be evenly distributed. This is really clear and I’ve been on the fence about it. I’m convinced now. Thank you. The part about the barley grain was so telling. I think we do need consumer gadgets like this, but so far, they’re not trustworthy.